This is the last of the daily posts from our vacation eats. Hope you enjoyed! Since I was severely overwhelmed by choosing a cupcake recipe from my new Martha Stewart’s Cupcakes book, I handed the book over to my friend Shelby and asked her to pick something for me to make. She chose Blackberry Cornmeal Cupcakes...mmmmm. We decided that they’re more like “muffcakes”…they were reminiscent of both muffins and cupcakes. I googled muffcakes out of morbid curiosity, and it turns out someone else was witty enough to think of the term before me. I'm thinking cupcakes, by definition, need frosting. Anyone disagree? 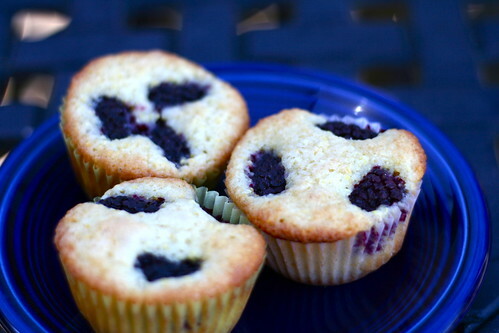 These muffcakes were like a sweet corn muffin with the added tartness of the blackberries. They'd make a great side dish for chili or a nice big salad, or could easily stand alone as a breakfasty treat. I'm a little baffled that my favorite domestic goddess didn't get that these certainly don't meet cupcake criteria...other than that, a resounding success! The method (especially placing berries on top before baking) was strikingly similar to the Raspberry Lemon Muffins I made a few days prior. Can't go wrong with berry-infused muffin-shaped treats. 1. Preheat oven to 375 F. Line 18 standard muffin tins with paper liners (Amy's note: if your muffin tins hold 12, like mine do, fill the empty cups with a bit of water before putting the muffins in the oven). Whisk together flour, cornmeal, baking powder, salt, and 1 cup plus 2 tbsp sugar. Set aside remaining sugar. In another bowl, whisk together buttermilk, eggs, and melted butter. Pour over flour mixture, whisking to combine. 2. Fill each lined cup with a scant 1/4 cup batter. Top batter with blackberries (3-4 berries per cup), then sprinkle evenly with the remaining 2 tbsp sugar. 3. Bake until evenly browned on top, 20-25 minutes. I handed the book to my boyfriend and asked him to pick one! Ha. I made the streusel ones... they're a bit muffin like too. You do drizzle them with glaze, but without frosting, they're just not cupcake-y enough for me! I did the same thing. I thought we were being clever and today I decided to google muffcakes and your blog was the first entry. I made the same recipe and everything. Too funny.